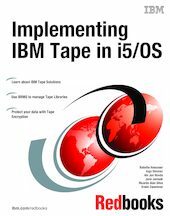 This IBM® Redbooks® publication follows The IBM System Storage Tape Libraries Guide for Open Systems, SG24-5946, and can help you plan, install, and configure IBM Ultrium LTO tape drives, as well as the TS1120 Tape Drive and libraries in i5/OS® environments. The book focuses on the setup and customization of these drives and libraries. The first part of the book gives an overview of the System i™ family of servers and describes how to attach and configure the drives and libraries. It also covers basic installation and administration. We describe the sharing and partitioning of libraries and explain the concept and usage of the Advanced Library Management System (ALMS). In the second part of the book, we document how to use these products with Backup Recovery and Media Services (BRMS), how to implement Tape Encryption, and how to use the IBM TS7520 Virtualization Engine™ with i5/OS. This book can help IBM personnel, Business Partners, and customers to better understand and implement the IBM Ultrium LTO product line, and also the TS1120 Tape Drive attached to System i servers. We assume that the reader is familiar with tape drives and libraries and has a basic understanding of System i servers and i5/OS.